Oh my goodness, it’s February! How did the last month slip by? Wait, how did the last 3 months slip by? 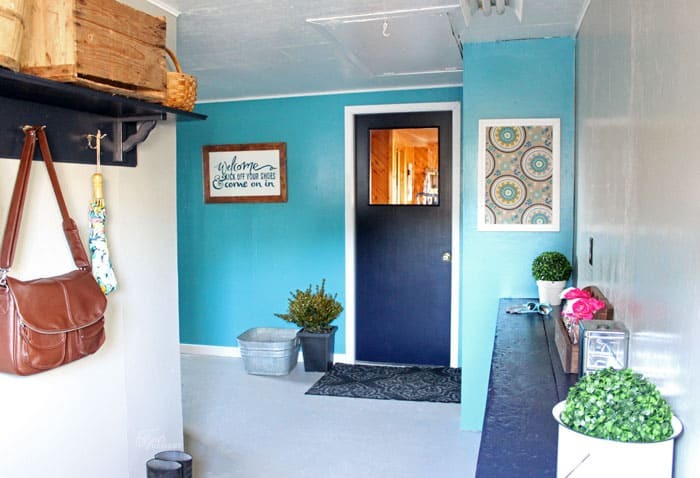 It was back in November when I shared this paint inspiration on Facebook and Instagram and haven’t had a chance to reveal this awesome mudroom makeover! My mom lives in an old farm house. 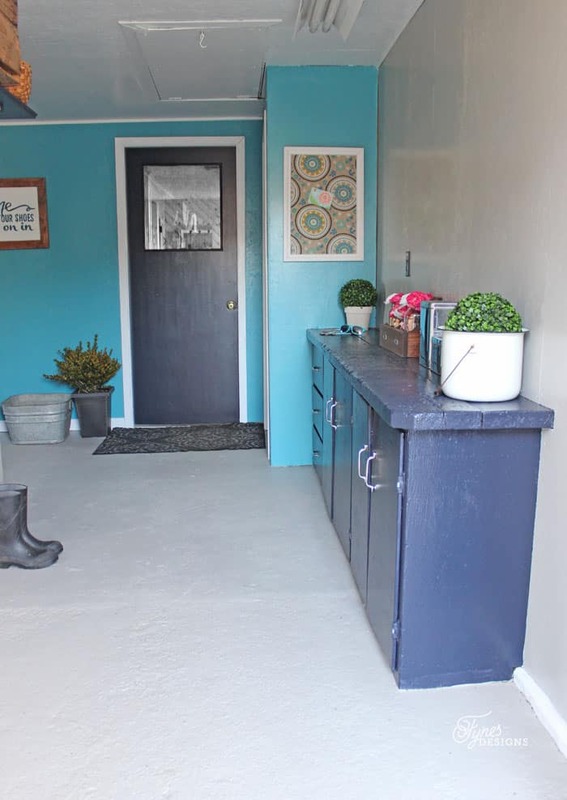 The large Mudroom (as we call the big porch) had doubled as the employee entrance for about 30 years, it had an employee washroom, farm storage, and where boots, coats and rain gear hung (essentially everything that needed a dropping zone). Since the farm had closed up shop a few years ago, the space still hadn’t been reclaimed into useable home square footage. My mom and I went on a cleaning and painting rampage just before the holidays and you’re not going to believe the results! It was amazing to see this transformation. Taking a space that looked so dark, dingy and dirty (since I was a child), breathing some life into it, and making a useable space was really something. 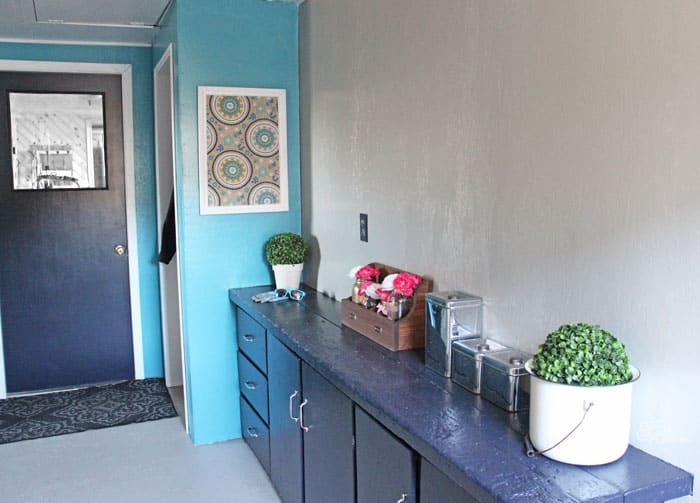 Can you believe the power of paint of paint in this mudroom makeover?! After a good cleaning the whole room was painted using PPG Voice of Color Semi Gloss Manor Hall paint. I chose to use a semi gloss paint for the added washability, plus it is a primer, paint and stain repellant all in one can! Choosing the colors is always my favourite part. 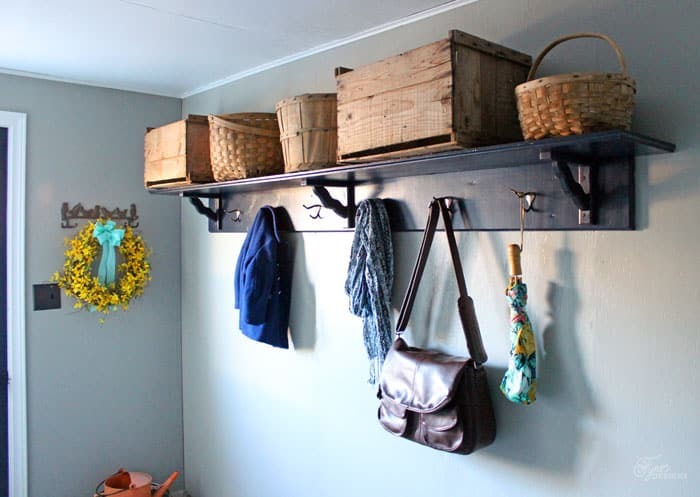 My mom didn’t have many requests, she just wanted something that would stand the test of time, and handle the everyday dirt of a mud room, and pleasing to all four seasons. I thought painting the room with a brighter accent wall would really give the look of the beginning of the house as her interior paint also has some great splashes of color too! 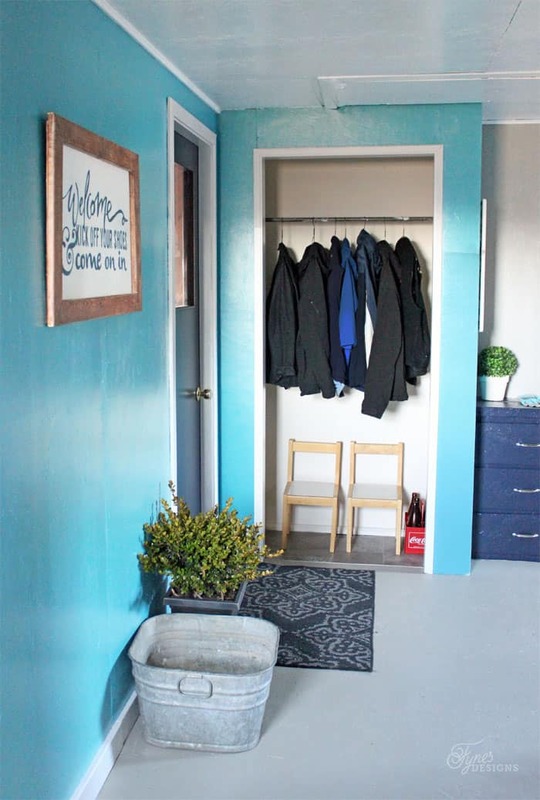 We didn’t do much other than paint this space, we changed the hardware on the cabinets, added a DIY bulletin board, and I painted the sign below with the leftover paint. This sign is perfect for the farm house, always family and friends dropping by to get some of my the cozy down home atmosphere and her yummy cooking (ok, probably mainly for the cooking, the smell of her home baked bread reaches all the way out to this pretty porch, the perfect welcome home feeling). This wall is a bit bare, but as time goes on I’m sure it will get filled with gardening necessities. 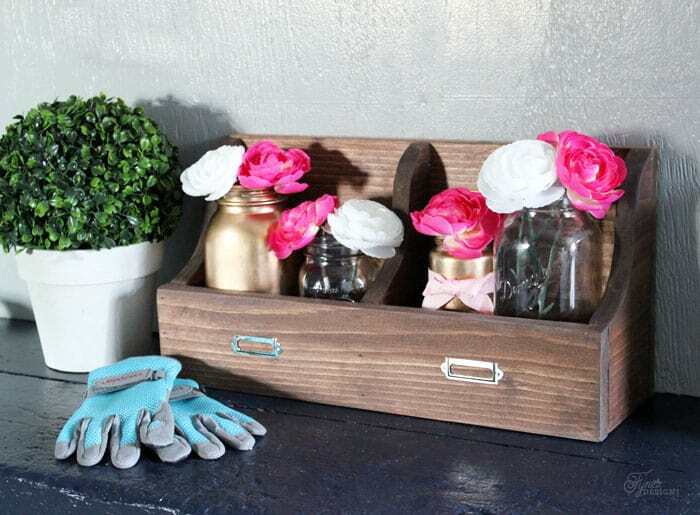 I also made this simple DIY mason jar vase box, as the weather gets weather warms I’m sure it will get filled with beautiful garden clippings. A few of the vintage baskets and crates kicking around the farm made for well disguised storage of hats gloves and out of season items. The old boot shaped boot rack made the throw out cut, too cute to ditch. This is original DIY at its finest. Plus I found a great place for the Harvest sign I created back in the fall. I think this mudroom makeover is by far the most drastic I’ve helped with, the whole family is pleased with the results. All it took was a little paint and elbow grease! 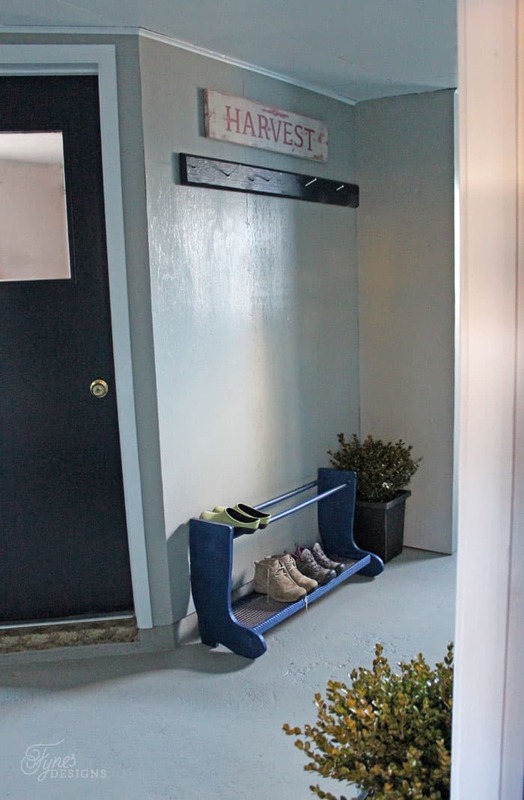 Thanks so much for stopping in to see this mudroom makeover. I have a few other little home makeovers in the works, I can’t wait to share them with you. Thanks Melissa, amazing what a little paint can do! Thanks for commenting, nice to hear from you! Love it SO MUCH! Linda is so lucky to have you so close… I might have to pay for a flight for you to come out and help me with my house once it’s ready! Wow wow wow! Virginia – this is amazing!! Thanks SO much Tara! Its so amazing to see such a drastic change with just a little paint! WOW, I am speechless at your creativity and talent. Girl this is amazing. Your mom must be over the moon happy! She is Cheryl! I was great to see this become a much more efficient usable space. Amazing!!! Love this beautiful space! Paint makes such a difference. Thanks for visiting Emily, Great paint, and fun colors really go a long way to a fresh new space! Unbelievable! I absolutely love the transition! My parents have the same sort of catch-all issue with their porch, too! I can’t wait to show them this. Great, great, great!! Thanks Megan, Its been such a big change at the farm house! Absolutely BEAUTIFUL!!! Doesn’t look like the same space.. LOVE! Thanks Christine! I feel the same way, I don’t know where to drop my boots now! I do love the new look of my porch,thank-you Virginia. But now comes the big job to keep it looking great. 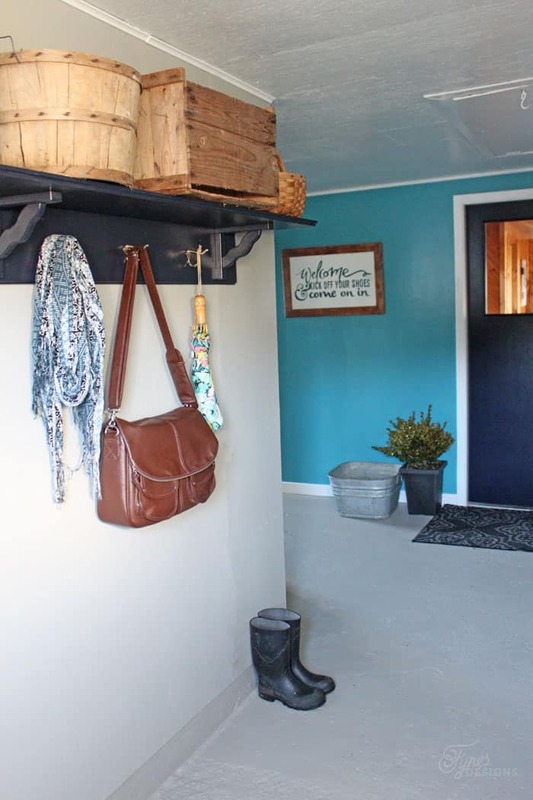 I lived on a farm and my parents added to the house a very large mudroom. Mom was so happy because we would undress there and not dirty the house that she was keeping spotless. Love the colors in this makeover! Ha ha Helene, our moms must be the same breed! Her house is impeccable, this space was where the junk went to die! Wow, what a transformation! She must be thrilled to have all that space and a fresh new look! Beautiful paint colors! Gorgeous! Love, love, love the power of paint to completely change a room. 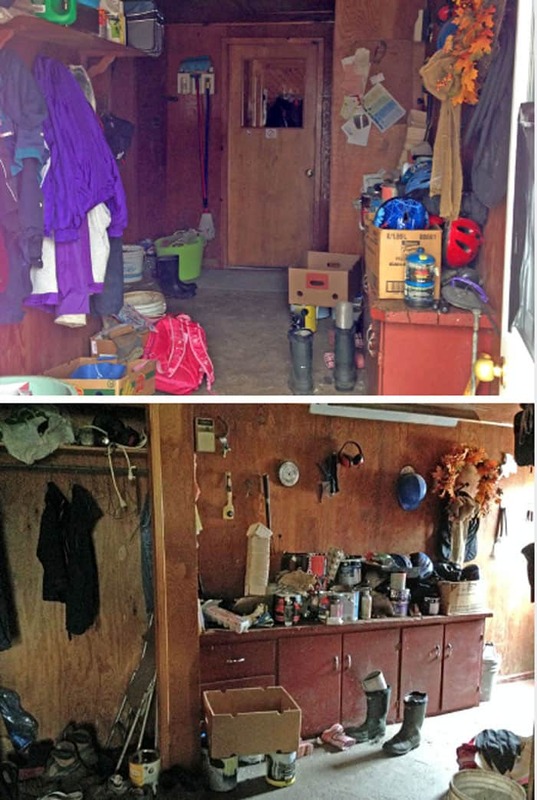 Incredible transformation (not to mention de-clutter!). I’m in love with Acapulco Cliffs. I must now go find something to paint that colour. Can’t wait to see what you come up with next. Wow, what a difference! It looks sooo much better and I do like that paint scheme, it’s farmhouse for sure with an updated feel to it! It’s hard to believe that this is the same room! 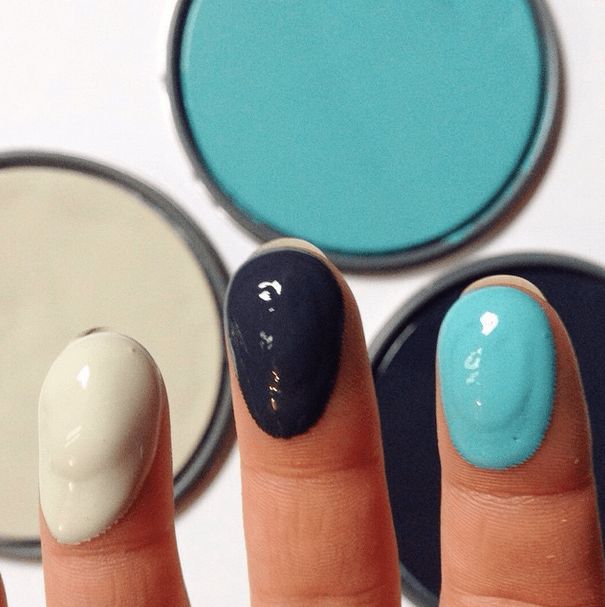 I LOVE the paint colours you chose – especially the bright blue! The porch looks amazing. The pictures are awesome, but it looks even better in person. Amazing transformation!!!!!!!! I LOVE THIS!!!!!!!!!!!!!!!! Thanks Rose, this was an extreme refresh, and didn’t cost a lot! Paint is a serious miracle worker on this job! Thanks for visiting! Love these colors! Thanks for linking up at the Thoughtful Spot Weekly Blog Hop! We hope you join us again next week! Wow, what a transformation. 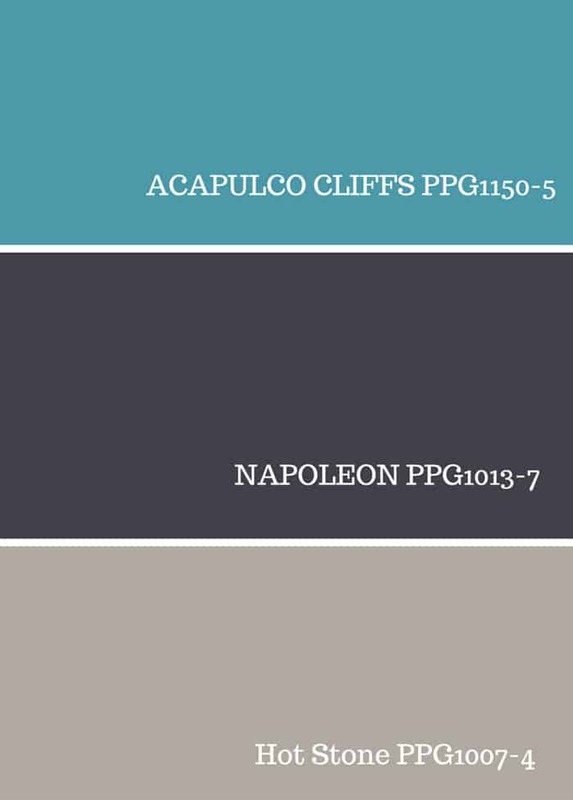 I love the colors, especially the Acapulco Cliffs. I would love to paint my bedroom that color. That is a very welcoming and calming color. Wow! What an amazing transformation. I am featuring this post tomorrow at the Thoughtful Spot Blog Hop! Thx for sharing. 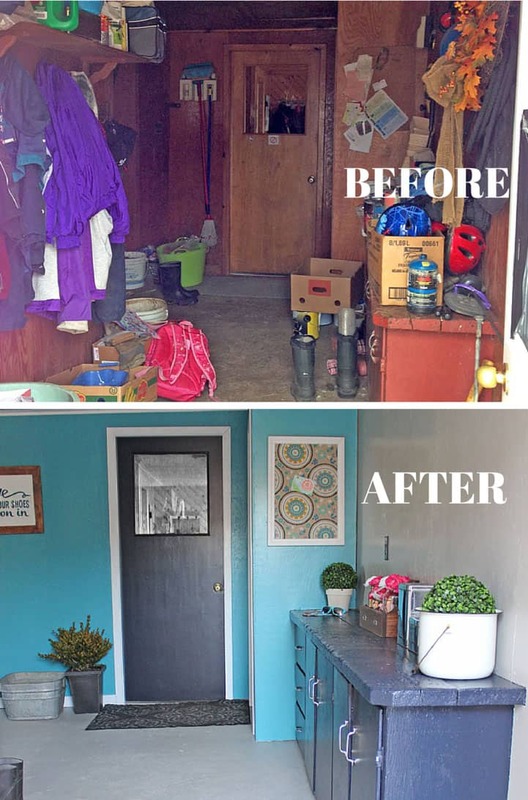 This transformation is incredible and it goes to show that you don’t need a ton of money to create a beautiful and functional space. Thanks for sharing at The Maker’s Link Party and you’re the featured blogger this week, woo-hoo! Thanks Katie, it was so refreshing seeing it all come together! Thanks for sharing this post w/ us at The Wednesday Roundup last week. It has been chosen as a cohost feature this week! Congrats. Hope to see you again this week. I am in love with the sign, “Kick your shoes off”. May I ask where you got it? Nebr mind, I see that you painted it. I so want one. lol!!! Ha, no worries Erin, I might be selling some soon! This is gorgeous! I didn’t envy you clearing out all that clutter but the effort was well worth it. You’re so right Janet! well worth the elbow grease! Before it looked like… well… as if it was not a house someone lives in. It looked like a barrack. Unfinished. The “after”, when nothing had changed except colors and things put in right places, looks like a real house! 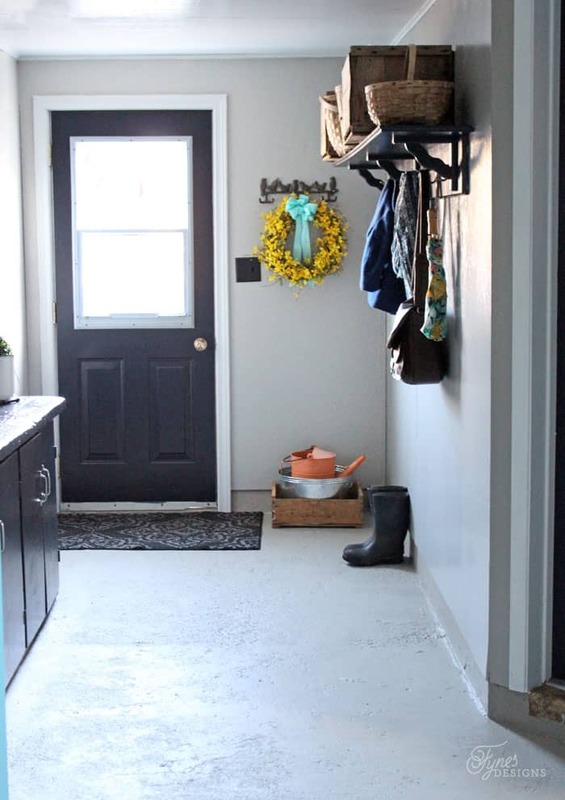 The most amazing to me was to see that it was really a well designed space with nice lines and thought of solutions to all that needs to fit in the mudroom, and that one doesn’t really need to change everything to improve something. Thanks so much for visiting. This before and after is one of my favourites because it isn’t all frooufy and staged for a magazine. Isn’t the power of paint amazing?! Have a great one, and thanks again for commenting! What a huge difference that made! I love the color you chose, it looks great and so cheery! Thanks for linking up to Snickerdoodle Sunday! Thank you for joining the Small victories linkup. Looks great! It’s amazing what a little color and some reorganization can do. 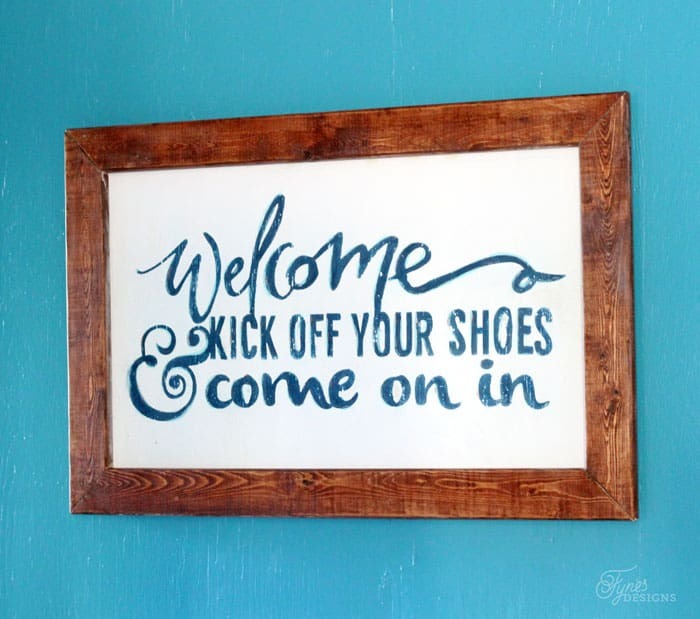 I love the Welcome sign too – a reminder to remove shoes without being pushy about it. It’s amazing what a little paint can do to a room! I love what you’ve done with the mudroom, it has been decorated so nicely. I love seeing the before and after pictures, what a change!